The volume Thinking About Animals in the Age of the Anthropocene, edited by Morten Tønnessen, Kristin Armstrong Oma and Silver Rattasepp, grew out of a conference entitled Animals in the Anthropocene: Human-animal relations in a changing semiosphere (University of Stavanger, Norway, September 2015). The book contains twelve chapters by international researchers from a wide variety of disciplines such as ecology hermeneutics, philosophy, social anthropology, semiotics and linguistics. 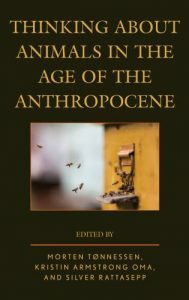 As is evident from both titles, a core focus of the conference and the volume is the impact of the Anthropocene on our perception of animals, and consequently, the relationship between human and nonhuman animals. Since “[t]he role and place of animals (…) so far [has] received relatively little attention in the Anthropocene discourse” (p. ix) this book “invites the reader to cast a wider net, and consider the role and place of animals in this geological age” (p. x). The introduction and first chapters offer a nuanced discussion of the notion of the Anthropocene. Susan Rustick states that “[t]he name [Anthropocene] appeals either to a feeling of god-like omnipotence or to a recognition of what incredible damage we have done to the Earth and the biosphere in a blip of time” (p.3). Most of the chapters take up the latter thread with the aim of identifying the various forms of damage. Of particular interest to some of the ongoing projects in the NaChiLit-research group, are the chapters that deal with interspecies issues (Dufourcq pp. 55-72; Meijer pp.73-88), the relationship between landscape perception and wild animal (wolves) perception (Drenthen pp. 109-126), and the philosophical discussion of animality in man (Brentari pp. 127-144). Taking a problematizing view of the age of the Anthropocene, Eva Meijer claims that “[i]n the languages of other animals, gesture, movements, and other nonverbal expressions play an important role. We can only study these languages properly if we let go of the idea of human language as the only true language” (Meijer p. 81). To follow up this perspective, it is important to study and compare how the communication between human and nonhuman animals is represented in both classic and contemporary children’s books; for example, Black Beauty (Sewell 1877), War Horse (Morpurgo 1982) and Mördarens apa (Wegelius 2014, Murderer’s Ape). Less common, but of great interest to this reader, were the issues related to ecoacoustics and soundscape ecology raised in the chapter by Almo Farina. The aim of this discussion of the ecological consequences of acoustic noise is “to contribute to the solution of the problems created by acoustic pollution both in human populated areas and in remote and fragile areas” (p. 38). An ecocritical examination of children’s literature could take as a starting point Farina’s investigation of how various representations of sound may influence the overall interpretation of nature in children’s literature, both paper-based and digital. A general comment I would like to make on the book is the tendency, in virtually every chapter, to conclude with a plea for change; for example, Rustick claims that “[w]e need to listen, to see, to smell, and to touch with a wider sense of self, with compassion, empathy, and respect for all who live here within a living Earth” (p. 17). This gives the impression of activism and of a desire to sharpen readers’ awareness, and to invite them to follow up the various perspectives in other fields of research by thinking about animals in the age of the anthropocene.